With school beginning and college football about to begin, summer is rapidly coming to a close. This sassy peach salsa is full of bright flavors and designed to take advantage of late summer peaches and plums. Like all salsas, it shows great versatility. It can be served as an appetizer with chips, or as a condiment on fish tacos. If you want to have it sit on a bun, try adding goat or cheddar cheese to your salsa topped chicken sandwich. When serving this to friends at a late summer BBQ or tailgate, you can’t go wrong! 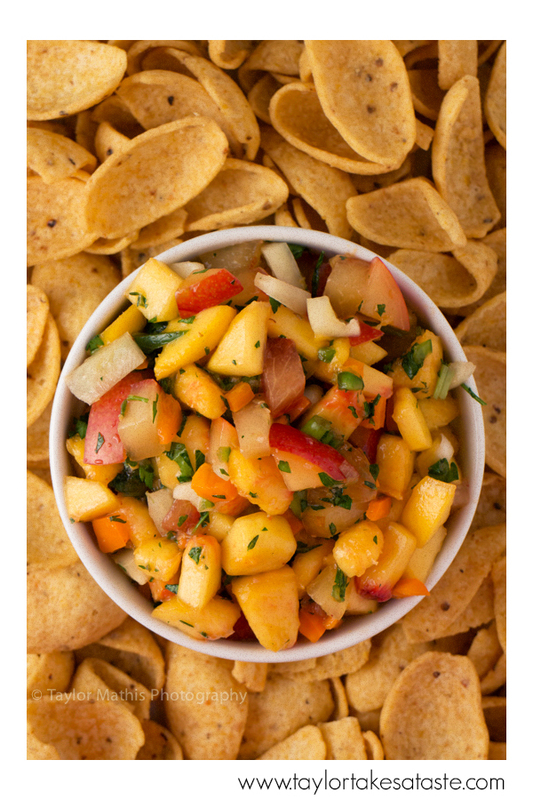 In a large bowl add the peaches, plums, bell peppers, scallions, cilantro and lime juice. Stir to blend. Add the jalapeno pepper, brown sugar, thyme, salt, ginger and lime zest. Stir to blend. Let the salsa sit for 15 minutes to allow the flavors to develop. Serve. Yum! I love it with fritos!